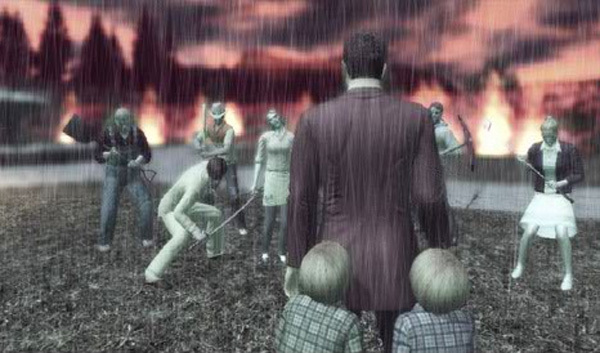 The Gay Gamer: The question is: Will I like Deadly Premonition as much as Frank Cifaldi did? The question is: Will I like Deadly Premonition as much as Frank Cifaldi did? When 1up.com's Frank Cifaldi reviewed Ignition's Deadly Premonition early last year (read it here), he called the game a mixture of The Last Express, Resident Evil 4, Shenmue and Twin Peaks. He also said, "a lot of the graphics would look right at home on the Dreamcast." Admittedly, most gamers would consider that to be a negative, but I'm such a big fan of Sega's consoles that it served to further pique my interest in this open-world survival-horror title. Hoo boy, this is going to be a weird game, isn't it? Anyway, after reading Cifaldi's review, and a few associated comments he made about the game on facebook and Twitter, I added Deadly Premonition to my "to buy" list--despite the fact that I didn't yet own an Xbox 360. Well, I now own an Xbox 360, and soon I'll own Deadly Premonition, too, since I ordered a copy of the game late last week for about $15. While I wait for it to arrive, I think I'll waste my time listening to this chiptune take on the title's "whistle tune." Am i the only one who thinks that the Whistle Tune would fit right at home in Animal Crossing? As for it being similar to Twin Peaks, the way I see it is it basically IS Twin Peaks fanfiction. It's just with changed up characters and a new mystery, but aside from that it's extremely similar. That's not a bad thing at all as Twin Peaks is incredible lol. OPEN WORLD survival horror? Like...GTA with zombies? How cool! Justin: As far as I know, yes, it's an open-world game a la GTA. Can't wait to try it! Marcus: Thanks for the link! I'll definitely read through that site before starting the game (tomorrow!). I've read that this game began as a complete rip-off of the Twin Peaks story, and after that was discovered the folks responsible for the story went back and tweaked it a bit. Sounds like they left a lot of their original inspiration in the game, though, huh? Oh it's really still so similar haha. I mean, there's a different sort of murder story going on now, but the feeling definitely remains there. Then there's things like "The Log Lady" changed into "The Pot Lady" for the game that cement it's still very close to the Twin Peaks inspiration. Regardless, it's a ton of fun! Also, I love your description of the game: Shenmue gone wild. Sounds like my kind of game!